SSgt. Kimberly Taylor and Cpl. Austin Walswick, members of the Female Engagement Team, along with interpreters Susan and Salim Mandokhil, conduct a “children’s shura” once a week to educate the children and engage with the local populace. 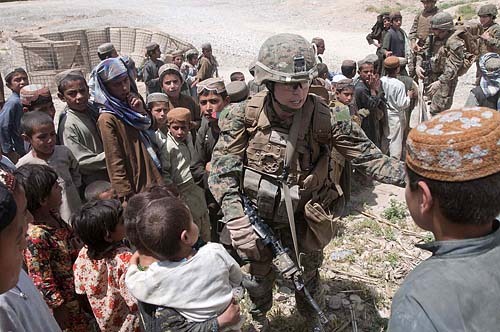 Marines from 1st Battallion, 7 Marines, Dog Company operate out of FOB Alcatraz (Tabac) in the Upper Sangin Valley on FOB Alcatraz (Tabac) in Sangin, Helmand on April 27, 2012.